Today I came home from a day of working in over 90 degree heat and stepped into a nice cool 74 degree yurt. How awesome is that? We’ve just gotten our heat pump installed, and not a day too soon. It’s been a little warm the last few weeks, to say the least. 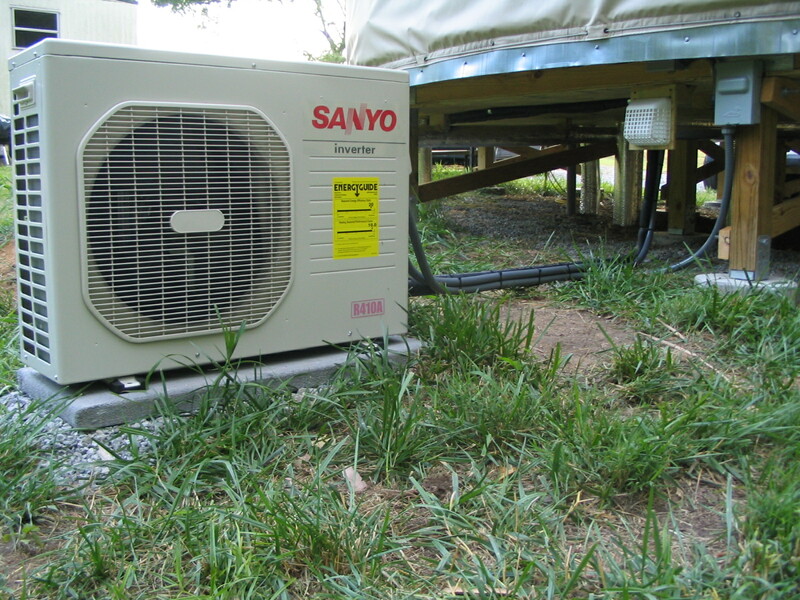 The heat pump is a ductless split system which consists of an indoor unit and an outdoor unit. Instead of using ducts to circulate cool or warm air, the indoor unit acts as an air handler. 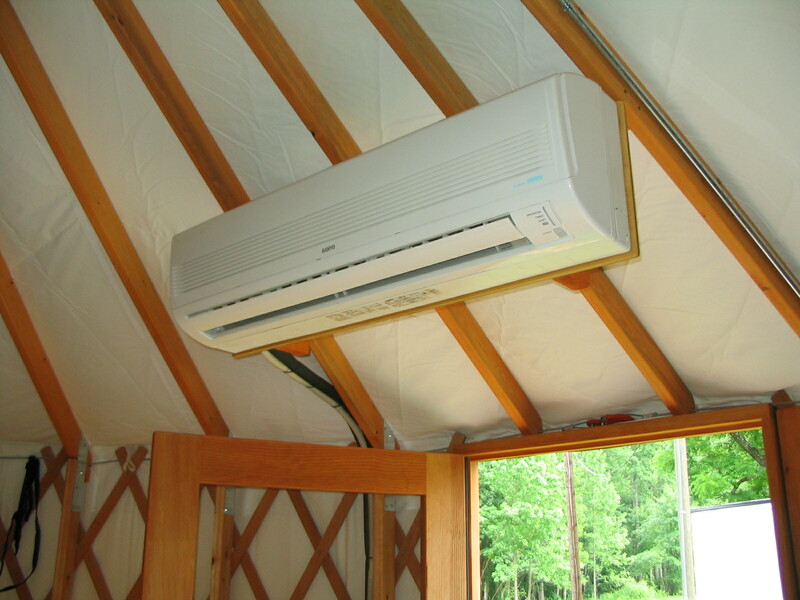 These types of heat pumps are great for retrofit installations where there is no existing ductwork… or, say, in yurts. This part is the indoor unit. It measures about 8″ x 12″ x 42″. It took us a lot of time to figure out where to put it, since our space is so limited. Originally we were going to put it above the refrigerator on the kitchen wall, but then we found out you have to maintain a clear space of at least five feet beneath the unit for proper air circulation. So we finally figured that really, the only place we have that would be clear at all times is in front of the door. Gavin built a beautiful mount for the unit and the HVAC folks came and installed the indoor unit. Well, that was a month ago. It turned out the outdoor unit was damaged, and they had some trouble locating a replacement. Finally they located a unit and installed it yesterday and today. Here’s the outdoor unit. It’s pretty small compared to the size you would see for a “normal” house; about 11″ x 25″ by 37″. So far we have been impressed with how quiet both the indoor and outdoor units are. You can hardly tell they are on. Really amazing. Here’s a shot of the mount Gavin made for the indoor unit. It’s what you see when you come in the front door and look up. He cut pieces from extra yurt rafters (that had been damaged in transit and we had to get replacements for) and used the same plywood that we have on the walls. The black tubing is insulation wrapped around the refrigerant line that goes to the outdoor unit and a drain line for the condensation that collects. Cool: literally. I was just browsing at your blog/website, and discovered your AC system. We have a yurt that is used as our living room/kitchen in Arizona, and I was curious about how well your system was working for you. We used a portable AC/Heater, this past summer, and will probably search for something more effective for next summer. Were the utility bills costly? Do you use this unit for heat as well? I did not see a woodstove in any of the pictures. Jean, the heat pump has worked well enough for us as both heat source and air conditioning. Our electricity bills haven’t been that high. We average about $100 a month in the coldest months, and about $40 in the hottest. And that includes our hot water heating and appliances which are all run by electricity. We used about 325 kwh over the summer and 900 kwh in the depth of winter. We have been happy with how the heat pump has cooled the yurt in the summer; but in the winter we are usually not as warm as we’d like to be. We would put in a woodstove if we had the room; I think that would be the most efficient way to heat the yurt. The unit we have has not been without problems though. We have had to have the installer come out and fix a water condensation dripping problem, and also the unit has been making some noise when it is running (you wouldn’t notice it in a bigger space, but since we are in 300 sq ft it is more noticeable I think). 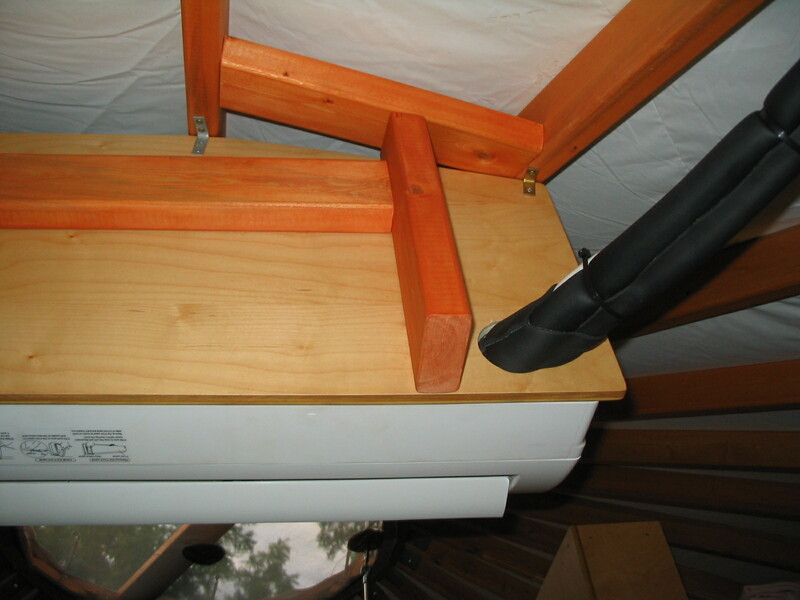 We also use a dehumidifier in the winter to get rid of the excess moisture in the space (from our shower and kitchen which are both in the yurt): this is not a problem in the summer with the A/C running, and it wouldn’t be a problem with a woodstove, but it is a problem with a heat pump. Overall, though, we are glad to have it in here. I can’t imagine not having A/C in the summer, it would be unbearable with our months of steamy 90s here in Virginia. And it’s nice to be able to change the temperature with the push of a button, especially after working outside in the elements all day. The split system interior unit has worked fine mounted as it is: we are glad it doesn’t take up any floor space. We looked at a lot of different options for heating the yurt, and the heat pump seemed to make the most sense in our situation. Krista, the heat pump is rated at 20,400 BTUs. For 11 months out of the year it has been sufficient to heat and cool the 20′ yurt, but for one month (or maybe 6 weeks?) out of the year it seemed to be running at full capacity all the time (January/February when it is extra cold). We did have another HVAC company do an estimate when we were building and they wanted to install a much larger unit (around 30,000 BTUs), but at the time we were really strapped for cash and chose the less expensive option. We have the bubble insulation too, used R-19 batt insulation in the floor, and put some foam strips around the bender board. My husband also thought we should put on storm doors to help with drafts, but he talked with the yurt manufacturer and they didn’t think it would improve the situation much. They recommended putting an insulated curtain over the doors, which we may try this winter. I think that most people just use a wood stove for heating. We have been happy with the indoor unit being mounted from the ceiling. Just make sure that you have it in a place where you won’t mind hot or cool air blowing. Ours is mounted right above our kitchen area so if we are making dinner and it is blowing cold air on you that can be a little annoying as the vent is not adjustable.